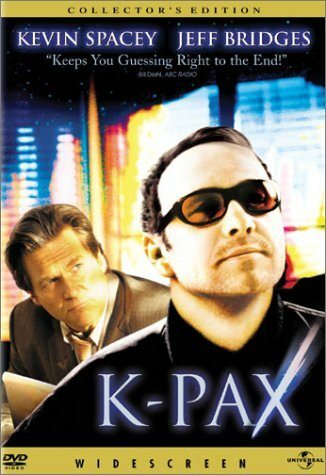 Buy the K-Pax DVD at Amazon! K-PAX is a 2001 film based on the eponymous 1995 novel by Gene Brewer. The movie is directed by Iain Softley and stars Kevin Spacey as Robert Porter and Jeff Bridges as Dr. Mark Powell. Robert Porter—who calls himself prot, which is purposefully uncapitalized and pronounced with a long O—claims that he is an extraterrestrial. As he tells it, he hails from K-PAX, which is a planet that resides in the Lyra constellation and is 1,000 light years from Earth. Of course, no one on Earth actually believes him and since port looks very much human, he is committed to the Psychiatric Institute of Manhattan. At the Institute, port receives psychiatric treatment from Dr. Powell who attempts to cure port of these ostensible delusions. port, however, seems unfazed and is able to consistently provide cogent answers to the questions that the doctor has about K-PAX and about how port managed to travel to Earth. There are also peculiarities that shake Dr. Powell’s certainty, such as port’s ability to see ultraviolet light, his resistance to chlorpromazine and his aptitude for astrophysics, which astounds a group of scientists when prot is able to give them accurate information of which they have been previously unaware. Porter/prot’s mission on Earth is to find an Earthling to take back to K-PAX. Many of prot’s fellow patients are excited by the notion and petition him to take them. Dr. Powell learns that prot expects to depart on a very specific date—July 27. The doctor confronts Powell because he believes this date gives insight into Robert Porter. Is this the date of a psychological trauma that haunts the patient? Dr. Powell explores this idea, which is when he finds the name Robert Porter and associates it with port. Porter is a New Mexico man who attempted suicide after his wife and child were murdered. Equipped with this new information, Powell confronts port again, but port seems merely bemused. In his own cryptic way, port comforts the doctor and tells him that he hopes he will take good care of Robert now that he has found him. Is port Robert or is he a being from the planet K-PAX? This is the question the story explores as it hurtles from the confrontation between Dr. Powell and his patient and the finality of July 27. Perhaps port is an advanced being who has come bearing the gift of an insight. Perhaps he is a man who has come out the other side of a dark tunnel with a more human but no less valuable kind of insight. In either case, it is surely a wisdom that will not leave Dr. Mark Powell unchanged. Site produced by NoLimitMedia. Hosted at WebRingWorld.